Seems like I should expect a lot from it when I see it's voting rate. The map seems to be properly packaged, but some further description could be helpful. That's its a deathmatch-oriented map can already be seen by the notification above the screenshot. Explain why you took the trak5 textureset, why such layout? etc. The screenshot is pretty good. It creates a fairly good overview of the map. - As less textures as possible, yet providing details (as in geometry and a proper lighting. This isn't recommended in a gameplay-based map due the high wtr count). A good example is collusion. - As much variation of textures as possible. This is because the trak5 textureset isn't providing any natural feeling as possible. A good example is skrdm1. The reason why these ways work is because trak5 is in general a pretty plain textureset (it's all grey and the colours which provide contrast aren't containing any high contrast). There haven't been used any texture techniques to actually improve the quality of the textures also (custom shader-settings, texture blending, vcommands etc). The geometry of the map is in certain ways pretty efficient, but it looks like you're not capable of making it less efficient. Try to use a certain scalar of curve around the map. Having a few curves which contain a decent amount of surfaces while there is a curve which actually can't be called a curve due it's side and appearance (like containing only 3 planes) next to it isn't creating a very natural feeling. The map contains only a very few amount of details. Be sure to add more to create more realism within the map. The atmosphere is very boring. Its all just plain white. Never do that, unless you know what you're doing (and I doubt you currently know). Always try to add a certain difference between the red, green and blue parameters (even just a difference of 10 could do the job). The clipping isn't great, but not bad also. This is due the fact players aren't running into any details what so ever. The flow of the map isn't as great as it looks like. After you run out of the curved tunnel, you suddenly *almost* fall into a hole (while the end of the tunnel looks like it just being cut off and ends no where). The jumpppad platform far outside the map could contain just a little stronger jumppad-entities. This makes players be able to get on the roof of the tunnel also. If it would be a first attempt, then it's not bad. But as such information isn't being provided, I just expect you to be mapping for certain years and know how to use the editor of Cube Engine 2 properly. That's why I rate the map 2/10, as nothing except the packaging, screenshot and the geometry (without attempting, luck you) is done right. "The map contains only a very few amount of details. Be sure to add more to create more realism within the map." True dat. Maybe make part of the map look broken. That will add more realism to your jumppad-station floating in empty space. I really do not understand the concept of "breaking things down to make them realistic". It almost sounds like some sort of fetish. It's not a fetish, rather a proper way to add more realism for the eye. Keep in mind, things which are different than the overall scene will eventually pop up next to other details within a map. People never look for things which are the same. They tend to look for differences instead. I'm talking about realism in sight, not physical realism (as for the flow or gameplay) if you weren't getting my point. 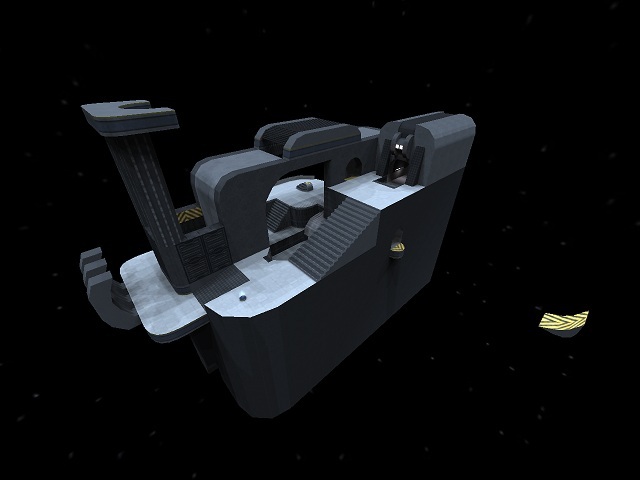 Sauerbraten's maps are way beyond the time of creating a map which is purely based on (almost) plain surfaces with nothing on it at all. Of course there are exceptions, like an abstract themed map would be (but I'm very sure this one is not). PS: I do understand that you were being sarcastic, just wanted to show some alternatives to 'broken', I'm bored of that. Jet engine in an airless vacuum? Interesting. May as well fill it with boxing kangaroos, just as unlikely they would actually function in space. Just some engine thingies, however you wanna call them. I'm pretty sure you understand my point. Yeah, this map isn't very good, quite plain, etc. etc. etc., what's already been said. However, one thing that I really like about this map is the jumppad path underneath the map. I don't know why, but I always find lower paths/areas so pleasantly unexpected. Now I feel the urge to duplicate such a path the next time I make a floating map. 2 for the path I i spent several lines praising above. Don't take this as a compliment for the rest of the map, that path just put a smile on my face. I guess a good way to sum up my comment is: The jumps are fine, now focus on the rest of the space.